When I need a fast paced book to distract me, something easy to read while life whirls around me, William Kent Krueger is one of my go-to authors. This is another of his Cork O'Connor mysteries. I have to admit that although I'm reading this series in what several web sites, including the author's own, say is the order of the books, they seem out of order to me. Yes, they're in the order of publication, but in one book Cork heads off to escape from a hit man, but the next book doesn't pick up where that one left off. Unless my memory is going. Which is possible. Anyway, the books are dark and terrifying and irresistible. Cork has been shot while trying to elude a vengeful mob boss who thinks Cork killed his son and grandson (who raped Cork's wife). Cork goes off to his distant cousin, Jewell, who's a veterinarian. She and he haven't spoken for years because Cork, a sheriff, once arrested her late husband. She patches him up and keeps him hidden. Jewell's son, Ren, and his friends Charlie (a girl), and Stash (a boy) see a body floating down the Copper River. Ren and Charlie try to find the body. They're seen by some men in a boat who are also looking for the body. The men see the kids. Charlie's father is killed, beaten to death, because he won't tell them where Charlie is, and Stash is hit by a car. Someone's looking for Charlie and has mistaken Stash for Ren. Despite his constantly bleeding leg, Cork has to find out what's going on. Dina, a former FBI agent who is now a security consultant, comes to help protect him. She used to work for the mob boss. Dina likes Charlie, a girl who sometimes has to go to a shelter for homeless kids when her father's too drunk and scary. A tough kid who's not really so tough. Dina identifies with her because she once was a kid on the streets, too. They put the pieces together and figure out where the body in the river came from and why the men are so anxious to get rid of the kids who saw it. There's also a cougar prowling around, unusual for that part of the country. Really, can you beat that? 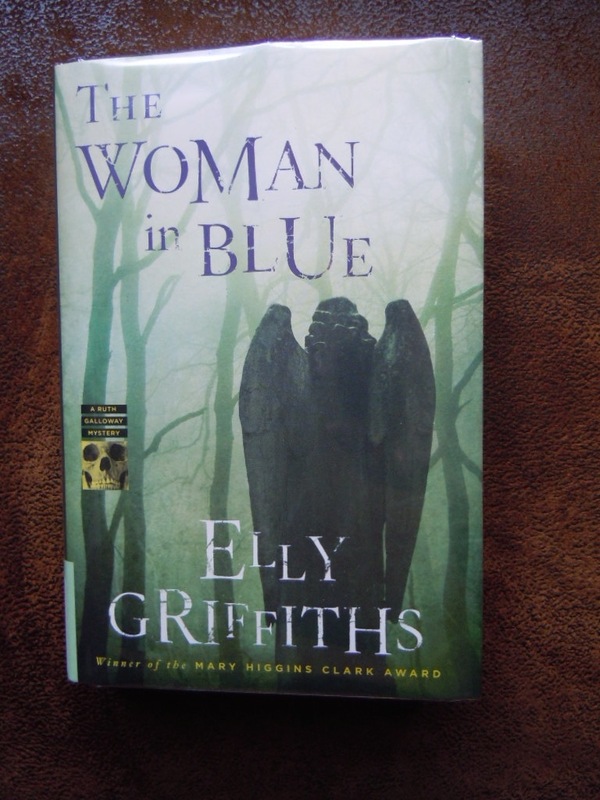 I love the Ruth Galloway series, so I was eagerly watching my name for The Woman in Blue get closer to the top of the library waiting list. 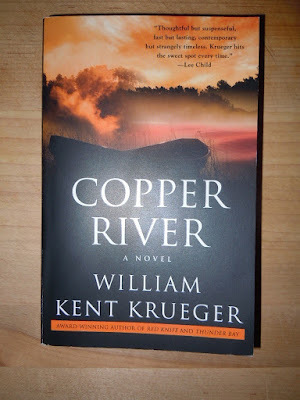 I picked it up on Thursday, read the first twenty pages before I went to bed, and finished it on Friday. Cathbad is house sitting in Walsingham for a friend. Outside, in the graveyard, at night, at a distance, he sees a beautiful young woman wearing a white gown and a blue robe. He calls to her to see if she needs help, but she only smiles sadly and shakes her head. The next morning, she's found strangled. She was a famous model with substance abuse problems. She was staying at a clinic about a mile away. DCI Nelson and his team must find the killer. But the killer's not finished. Nelson's wife, Michelle, who looks very much like the model, is attacked and almost strangled. Then a woman priest, who also looks like the model, attending a conference for women priests in the town, is strangled. Who? And why? There are many suspects, but few motives. Ruth and Nelson and their complicated relationship come into play. Nelson finds out something about his wife that enrages him. He gladly says goodbye to a team member. The mystery comes to an exciting end during the Passion Play put on by the town. There's not a lot of archeology in this book, and archeology is one of the reasons I like this series. This book is more centered around religion: Passion Plays, women priests, Catholicism, Anglicanism, the cult of the Madonna Lactans. But the characters are strong enough to keep my interest. And there's a puppy! I just realized I wrote this assuming that you've read the other books in the series. This is one series I think you should definitely read in order. Too many things happen to the characters as the books progress that affect how the characters act in later books. If you haven't read the previous books, I don't think you'll understand some things in the later books. I was just complaining about series books written by authors other than the original author, like The Girl in the Spider's Web, and others I can't think of at the moment. Authors of series with many, many books often run out of steam, or plots. 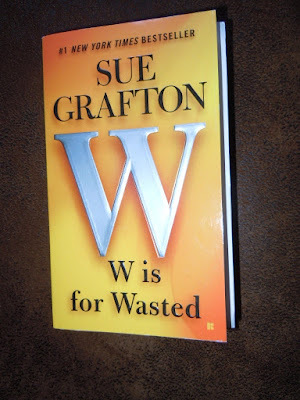 Sue Grafton amazes me. I've read all of her Kinsey Millhone books except 'V' is for Vengeance and X and I still find them exciting. I like that Kinsey hasn't aged dramatically from the beginning. I don't want to read about an old Kinsey tracking down criminals in her wheelchair. The books are full of familiar people, places, and situations, but they're not stale. 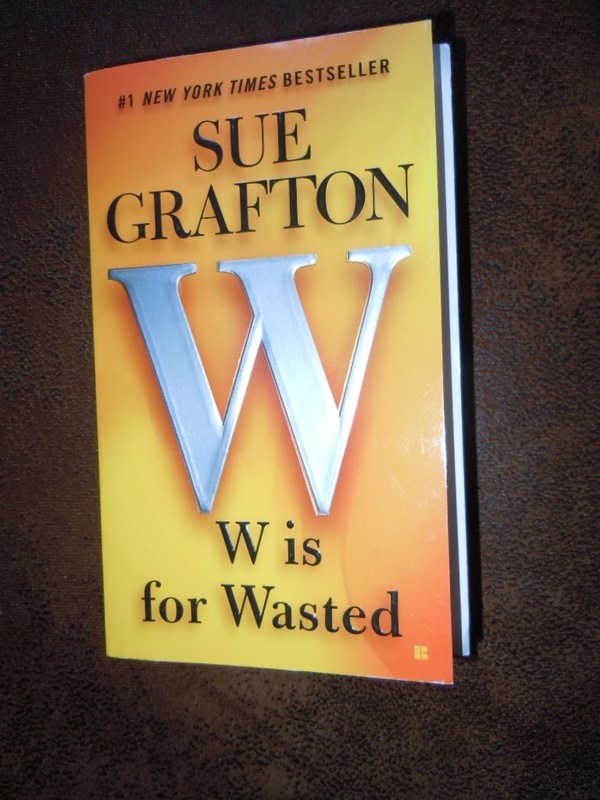 In W is for Wasted, Kinsey finds a new group of friends: a bunch of homeless people, most of them addicts or alcoholics. But they're not bad people. MOST of them are not bad people. R. T. Dace, one of them, dies. Kinsey's name and number are in his pocket. She has no idea why. As she gets more involved, she's astounded to find that she's been named executor of his estate and is his sole heir. There's a good reason for this, but it takes some digging to find out what it is. His three grown children are not happy at being cut out of the will. He had been convicted of a crime he didn't do, was exonerated, but at least two of them still didn't believe he was innocent. When he tried to make amends, they turned their backs, so he disinherited them. Kinsey wishes that she had no family. She had enjoyed being an orphan most of her life. Families are complicated. As they say, you can pick your friends, but you can't pick your family. And some of hers are dillies. There's also the mystery of who shot and killed another private investigator, Pete Wolinsky. When Kinsey finds a connection between Dace's death and Wolinsky's, many things fall into place. There are some medical matters that had me skimming, but not big bits. I'm not as patient as I used to be. They were necessary for the story and were interesting - to a point. I'll be looking for V is for Vengeance and for X to bring me up to date. I'll be waiting for the end of the alphabet, too. I'm not having an especially good run reading series books. 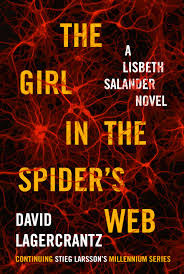 I complained a bit about The Murder of Mary Russell and I've just finished this book, The Girl in the Spider's Web, a continuation of the Lisbeth Salander (Girl with the Dragon Tattoo) series. I loved the original three books in the series, the ones written by Stieg Larsson. I loved them so much that I ordered the last two from England to get them before they were available here. This book was not written by Larsson. The main characters are back: Lisbeth Salander, Mikael Blomkvist, Erika Berger, and others. Millennium, the magazine that Blomkvist and Berger own has been bought by another magazine that wants to change the focus. They're sorry they sold and are thinking of ways to buy it back. The Girl in the Spider's Web is about internet surveillance. It's about the NSA spying on private citizens, on other foreign spy agencies, and on corporations and private small businesses and innovators. It's about all those agencies spying on each other. And on us. A brilliant professor who has been working on Artificial Intelligence (AI) is murdered in front of his autistic son. The boy has never spoken. Now the people who killed the father realize that the boy can identify the killer. The boy has an amazing gift for detailed, photographic drawing. Lisbeth identifies with the boy, who has been abused. She takes it upon herself to keep him safe, taking him with her and hiding him from everyone. There are leaks in the police and the NSA. She doesn't trust anyone. Lisbeth's twin sister shows up as the lead of an evil empire. She's out to get Lisbeth and she'll go through anyone who gets in her way. The last part of the book was exciting, but I think that the characters lacked depth. They seemed like cartoons of themselves. It's hard for me to put my finger on it, but I just wasn't as engaged as I was with the others. If I don't do a post about a book, it doesn't mean that I didn't like it. Although it might mean that. It may be part of a series I'm reading through rapidly and I don't want to bore you with another rave review. I might review a book because it's not as good as the others in a series. The Westing Game left me confused. It's a YA book, I believe. But there were people in it who weren't who weren't who they seemed to be and who were dead or maybe weren't dead. There were murders and an annoying little girl who was the detective. I'm easily confused and can never find my way out of a maze. Home Life is another in the series of Alice Thomas Ellis's collected columns written for a British magazine. I enjoyed it, but I have to admit that the first one I read, simply called Home Life, was much better than the other two I've read. Blood Hollow did not disappoint. It's compelling, exciting, and satisfying. It has lots of action. I bought all the Cork O'Connor books in the series and am savoring them at fairly short intervals. Ditto with the Dana Stabenow Kate Sugak series. Always good. I'm currently reading a chunky book, London Belongs to Me by Norman Collins. I'm enjoying it, but it's going to take me a while to finish it. Life intervenes. I'm also taking a Future Learn online course on Shakespeare's World. I've taken several of their courses, and because they're set-your-own-pace courses, I like them. But if I get behind, I feel pressured to catch up. They're not always in depth courses, but they're fine. I hope you had a nice April. May, as it begins, feels more like April than May. Here's hoping for a warm and pleasant May, full of beautiful flowers and lots of time to read. I've finished a few books since last I posted, but I haven't felt like posting. Too many trying things going on. 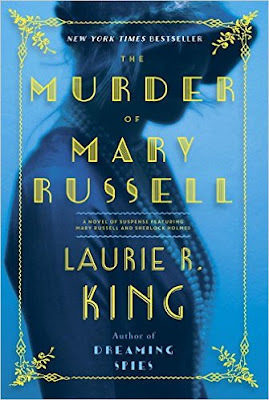 I thought I should at least post about this book, The Murder of Mary Russell by Laurie R. King. I like the series, although there was at least one that left me cold. The Murder of Mary Russell starts out with Mary alone in their house. A man comes to the door and says he's looking for Mrs. Hudson. Mary's uneasy about him, something doesn't feel right. As she returns from getting tea, he confronts her with a gun. Mrs. Hudson and Holmes return to find Mary gone and blood on the floor. What has happened to Mary? The book then tells Mrs. Hudson's backstory - which, for me, went into too much detail and went on too long. That's about the first 1/3 of the book. I resorted to skimming. I got the idea, Mrs. Hudson and her relationship to Holmes were not what we thought. Her past has come back to haunt her - and Sherlock.